Gun metal alloy is a copper-tin cast alloy to which zinc is added. Lead can also be added to improve machining and gliding properties. Due to its properties, gun metal alloy plays a special role among the tin bronzes. It is corrosion resistant and also resistant to stress corrosion cracking and dezincification. Gunmetal is used in the building industry for valves, screwed, soldered and pressed fittings for sanitary and heating engineering. Particularly in sanitary installations, gunmetal is ideal for shut-off, safety and control valves, as fittings material for pipe system components or as constructional material in water, filter and purification technology. Gunmetal is ideal for universal use and can be combined as required with all known installation materials (copper, stainless steel, galvanized steel and plastic). Gunmetal with the correct composition can be used without restrictions in drinking water applications. Gunmetal comes in different chemical compositions as per the requirement and application, some of the compositions are 85/5/5/5, 88/10/2, 88/8/4 and so on. 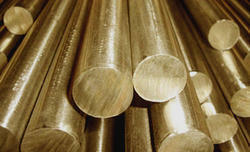 SIMCO manufactures and supplies Gunmetal in the form of Bars, Strips, Rods, Sheet, Foil, Ingots, Pipes and Components.